A soulful house track as our Tune of the Day and it’s not a Monday, check us throwing caution to the wind! But, as you plough throw loads of submitted reviews and digital promos, trying to pick one as a Tune of the Day, sometimes a record just grabs you. 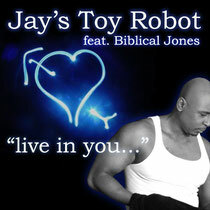 Like this one did, from Jay’s Toy Robot, featuring the vocals of Biblical Jones. ‘Live In You’ is the third release of 2012 for Rootz Records and so far is available in three mixes, the original, the Jay Deep remix and the final one from French producer, Stone Willis. The original is solid, reliable soulful vocal house, just the way it should be – a strong 4/4 bassline and Jones’ great vocals giving a spoken word style story of his love for his partner. The Jay Deep mix ups the tempo, still keeping it very much in the soulful house category, but adds more keys and trumpet, giving it a slight jazz house touch too. Stone Willis keeps the vibe going with chunky beats, spoken word and piano, again, another energetic mix. Three similar but yet very different mixes, all very playable. Check it out below.